An app to learn while having fun is how the makers of ‘KiddieDoodle’, Livares Technologies Pvt Ltd, define the app which is available on the Google Play store. Currently there are two versions of the app, English and Malayalam, but the company is working on Russian and German versions too. There are paid and free versions of the app, which is currently available on the Android platform, the catch is that “in English, for letters after ‘I’ you have to pay,” says Aneesh Chandran, Chief Operating Officer of Livares. The Malayalam version is free. The interactive application teaches young children and foreign learners the alphabet in Malayalam and in English (for the English version). The team is also working on a version for iOS-enabled and Blackberry phones. The app embodies the ‘play way’ method. There is a monkey, there are butterflies and ladybirds, it is a ‘fun place to learn’. The learner can trace the letter on a touch-screen phone to learn writing. The learner gets familiar with the corresponding sound and a word too. In the KiddieDoodle Malayalam app a flower guides movement along the letter as it is traced. “There is a particular way, a pattern, of writing a letter and if the person goes wrong then the flower doesn’t move,” says Aneesh. For every right ‘move’, a virtual fruit is rewarded. There is a Free Draw option that, besides helping ‘parents initiate kids with ‘Harisree’, offers the added attraction of saving and even mailing the lessons. 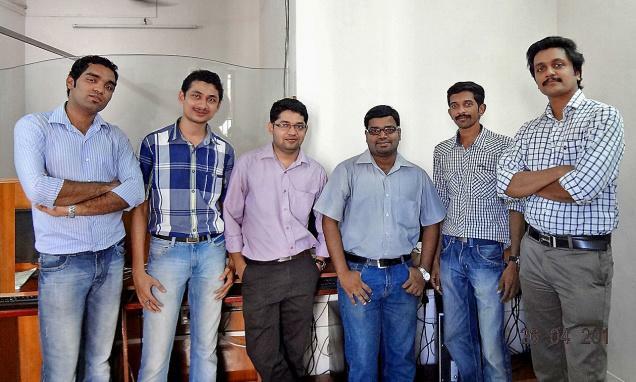 The other major achievement, according to Aneesh, is creating the ‘Labhaprabha’ app for the State Government. “The complicated process involved in registering for the Labha Prabha scheme is an occasional deterrent. This is where the app comes in…it is as simple as, well, downloading an app on your mobile device,” Aneesh elaborates. Meter readings can be saved, with time and date, for future reference and, he believes, this app will encourage more users to participate in the scheme. The directors of Livares are, besides Aneesh, Aneez Ahmed.N, Jaseel A.R., Mahesh K.M., Rineez Ahmed N., Sumesh R. Nair, Shihas A. S.
While they wait for their physical space in Technopark, the guys at Livares are busy with all things virtual.